My first novel which has just been released titled ‘Nirmala: The Mud Blossom’ was an accident. I had no intention of writing this story, let alone framing and formatting it into a novella. Yet when I pass the many filthy slums of Mumbai surrounding sky rise buildings and towers…I think to myself that maybe my character Nirmala and I both were accidents. Nirmala, was tossed into a dustbin because she was a girl…I was sent home to my mother’s family because I was a girl. Nirmala and I are two really different people and I can’t understand how I managed to write about her in the first place. Do I empathize with Nirmala? Maybe. Do I sympathize with Nirmala? Maybe…but one thing is for sure. Nirmala got me thinking about reality, the reality that girls in India are not wanted…Nirmala and I both were not wanted. Many people after reading the script of Nirmala before it was published thought that maybe I was venting out my feelings of my own personal social tragedy…maybe…maybe not, but isn’t that the forte of a writer, to put a part of herself into the work she is creating? Maybe Nirmala was a character my subconscious mind wanted to bring out in ink…a character which ran in my blood and I did not know it. I realized that my father and his family did not wish to look after me because I was a girl only when I was in high school. Everyone in my maternal home thought I would take it nicely which I did externally…but inside…it hurt, it still hurts. From that day on, I also came to the realization that it was because of me that my mother’s and father’s marriage broke…I had ruined my mother’s life and I feel the guilt…and that too hurts a lot. Nirmala never broke up things; she tried to bring about understanding and unity…by breaking every piece of her existence and thrusting down those pieces into a mad cauldron of gender inequality. It was my Sociology professor in college who brought to my notice that I could do very well as a Sociology student. He felt I had the guts and the grit to tell things as they were──the naked truth of the matter. He saw this in my Sociology projects especially ones dealing with gender discrimination issues. I had no clue then that I would one day create Nirmala…the child of the slum…the slum which is the face of reality…the reality of the unwanted girl child…the nightmare of my broken family life. It took me only a month to write the book ‘Nirmala: The Mud Blossom’ but it will take me a lifetime to understand why I wrote about her. Why could I have not written a fantasy novel…something popular…something that would require a sequel…but I wrote about Nirmala. Yes! I wrote about Nirmala. I wrote about the abuses meted out to her, her fears, her aspirations, her disappointments, her anger, and her lively spirit…all which is not me and yet…it is me…for Nirmala lives in me and yet I can’t really say that we have had a dialogue. We don’t talk about it, just the way I was told by my mother that my father’s chapter was closed; she did not want to talk about it anymore. What effect has Nirmala had on me as her creator? Would it be scandalous if I said we both don’t see eye to eye? For the fact is that we don’t really like each other but we tolerate each other, just the way Nirmala in my novella tolerates the gutter stench in her slum and the reeking of dried blood over her wounds. However, I’ll never be able to forget about Nirmala for she was one character that got me to think…to think about Mumbai’s future with the expansion of slums and the children of these slums who urinate and excrete on the streets of our city. Have I failed Nirmala or has Nirmala failed me as a writer…only time will tell. We both found our roots in rejection; I hope that one day we both find our happiness in the blossom of our hearts. Nirmala: The Mud Blossom graphically depicts the travails, discrimination, and abuse faced by female children in India from the cradle to the grave. Not an easy read I thought before starting the book. Despite it is a fictional story, it is a clear indictment of India and the inhuman way women and girls are still being treated today. However the story immediately drew my attention and I finished this powerful, fascinating novel in one reading session over the weekend. The Reason for Writing this Story? 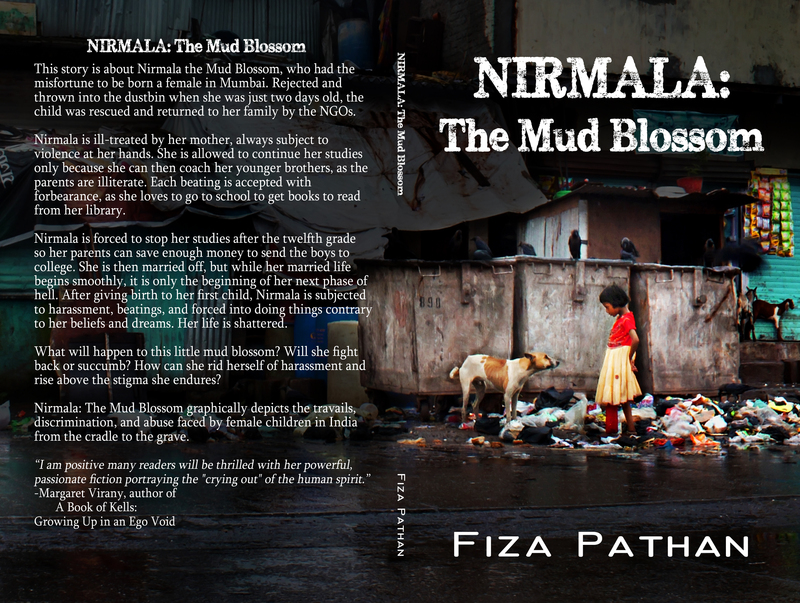 I was wondering how Fiza Pathan, a very well educated, and well-off writer, could tell the story of Nirmala the Mud Blossom. After all I knew her for her great non-fiction work CLASSICS: Why We Should Encourage Children To Read Them. And now a novel that takes place in the slums of Mumbai?